It's difficult to imagine a world without access to computers and internet. In a lot of rural towns in the Western Cape that's the reality. This is no different for the small village of Klaarstroom 60 kilometres from Prince Albert in the Western Cape. With its population of just more than 500 people there's a need for access to information and communication technologies (ICT). This is the kind of rural community that the Cape Access programme wants to assist through setting up eCentres for these communities. The Klaarstroom eCentre was opened in 2016 in the Central Karoo district. Now the centre forms an integral part of the community. The centre employs interns to prepare them for their future careers. They also assist the interns with bursary, university and study loans applications. This eCentre is making remarkable progress with their basic and accredited computer training. Over the last 2 years, the centre had 2 graduation ceremonies. 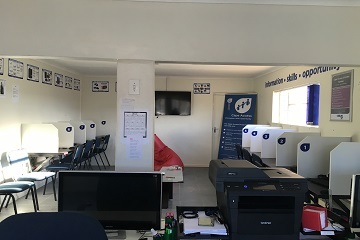 Now Klaarstroom has 15 more residents who are computer literate. The next graduation will take place in May 2018. Last December they partnered with the Prince Albert municipality to host a successful holiday programme for the children. The success of this has led to talks to make this an annual programme. The Klaarstroom eCentre, as with all the other eCentres in the province, has helped many community members to find jobs, apply for and get accepted at tertiary institutions and help them keep in touch with family and friends who live far from them. These centres are open to all. The Klaarstroom eCentre offers the below services and training to the community. • Internet access (45 minutes a session). • Online job searches and applications.